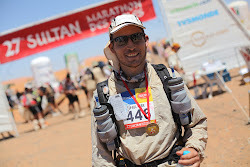 Thank you so much for running this year’s Marathon des Sables for Mencap. We fully appreciate how much effort and commitment went into both your training and fundraising and we are extremely grateful for your support. Please follow this link http://youtu.be/8S_hCA-b1L8 for a special thank you from Josie, one of my colleagues with a learning disability. You have raised a fantastic sum of £9,858.20 which will go towards making sure that more children and adults with a learning disability can live their lives to their full potential. Once again, well done and a huge thank you.